If you are squeamish then stop here. 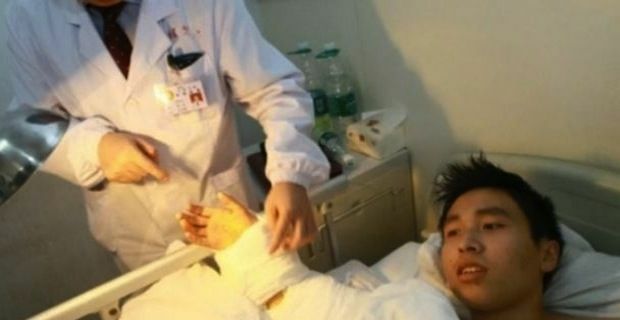 A Chinese man, 25, known only by his nickname Xie Wie had his right hand severed off by a drilling machine in a factory accident in Changde, which is located in the Central province of Hunan. The man attended hospital in the provincial Capital seven hours later at which point the damage was too severe to attempt a reattachment immediately. The limbs tissue may have died before any operation could have been completed. It is known that if blood supply is restored to a severed limb within a certain number of hours the limb can be saved. With this knowledge doctors made a decision to attach the severed hand to Xie Wie’s foot, just above his Achilles tendon, to keep it alive while his right hand healed enough for a reattachment to be performed. The severed hand remained on his foot for over a month before doctor’s removed the hand from his foot and reattached it to its regular position. This is just the beginning of recovery for Xie Wie as he will have to undergo further operations and will require rehabilitation therapyin an attempt to restore the hand’s function. Xie Wie’s primary doctor has been quoted as saying “It’s just like building a house. Currently the main body is established. There will have to be interior decorations in the future”. Xie Wie’s reaction was one of disbelief. “I just thought it was miraculous. I would never have thought that my hand could be saved”. At this point he said his hand was still numb and it could be months before it is functioning. The hospital did say that there would need to be a significant amount of rehabilitation for the hand to function better than a prosthetic hand.